We don’t think it’s just a coincidence that Father’s Day falls on the first day of summer this year. Let’s help him greet the riding season and reward all our favorite dads for the things they do all year with gifts they can enjoy all summer. And, if you need a little help picking out just the right item, we’ve got a list to help with your search to be sure he’s smiling on his special day. It may be that all he needs is a brand new outfit to be ready for a whole new season of fun on the water. If so, hook him up with great gear from head to toe. Starting with the Sea-Doo Amphibious Riding Goggles. They are incredibly strong, lightweight, and they float. The flexible frames shape to the face and not only are the lenses polarized but they offer 100% UV protection. These are the perfect goggles for the dad who really likes to pull the throttle. A rashguard is great for anyone who likes a bit more of a barrier between themselves and the elements. The Vibe Rashguard provides sun protection to that of SPF 50, and is fitted for comfort. The mock turtleneck collar adds a little extra protection and there is also a boardshort connector keeping everything exactly where it’s supposed to be. And, let’s not forget about the importance of safety. The Vibe PFD is made to match the Vibe rashguard in design and function. The large armholes allow for full movement of the arms and this PFD is made with a super-duty nylon outer shell. It’s a great value that can be used for a variety of water sports. Is there anything more comfortable than boardshorts? We don’t think so. From relaxing at home to heading out to your favorite waterfront restaurant, The Cove Technical Boardshorts look and feel amazing. The quick drying 4-way stretch fabric is very light and the boardshorts include a removable lightweight stretch neoprene inner short for protection when riding your Sea-Doo watercraft. Moving down to those toes, the Sea-Doo Sandals are comfortable footwear that mold to the feet. If your dad is anything like the rest of us, he won’t go anywhere without a few essential items. The Sea-Doo Duffle Bag is designed specifically for extended outings and day trips and features a couple of special pockets. One pocket is waterproof and the other is a cooler. It’s multi-functional for a packed day out. 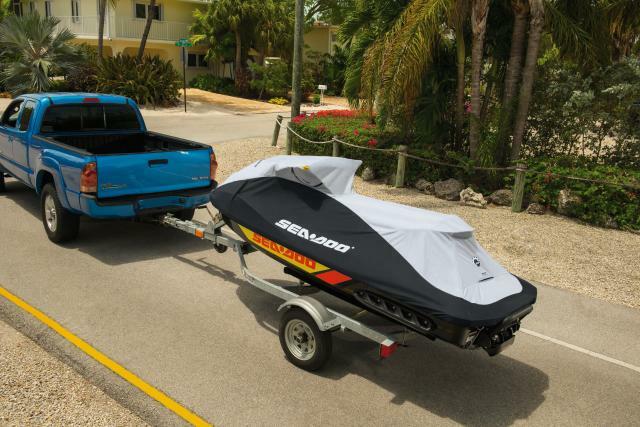 With dad taken care of, let’s be sure his Sea-Doo watercraft is as well. The Snap-In Fenders are easy to install and remove and will help prevent dock damage. So now, his ride on the water will stay as pristine as his ride to the water. Now, he’s ready for ultimate relaxation and a perfect start to a perfect summer.